The Godoy Arquitectos architectural studio presented a real gastronomic challenge as a project for the 9th PORCELANOSA Grupo Architecture and Interior Design Awards: Sushi Concept Restaurant. 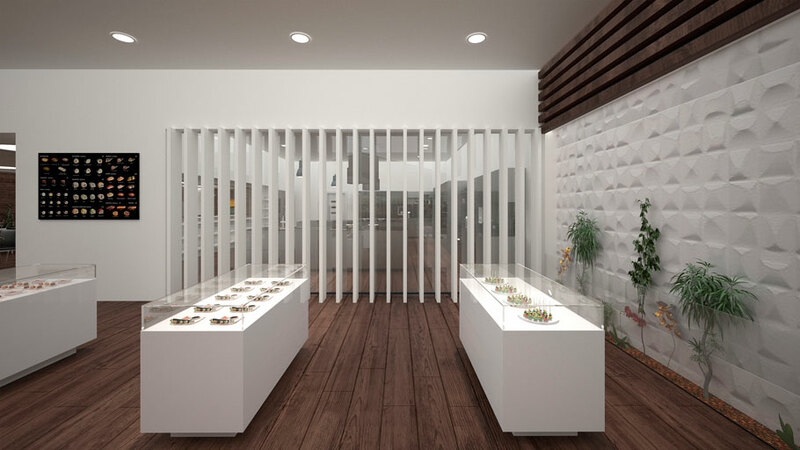 The project, which was a finalist in its category, was conducted by Juan Carlos Sanchez Arenas, who was inspired by the land of the rising sun when defining a cosy and oriental looking concept store with sushi as the main attraction. Seduced by the Japanese cultural rise in Spain, Sanchez Arenas defined a Japanese restaurant with an open kitchen, which is joined with another premises. 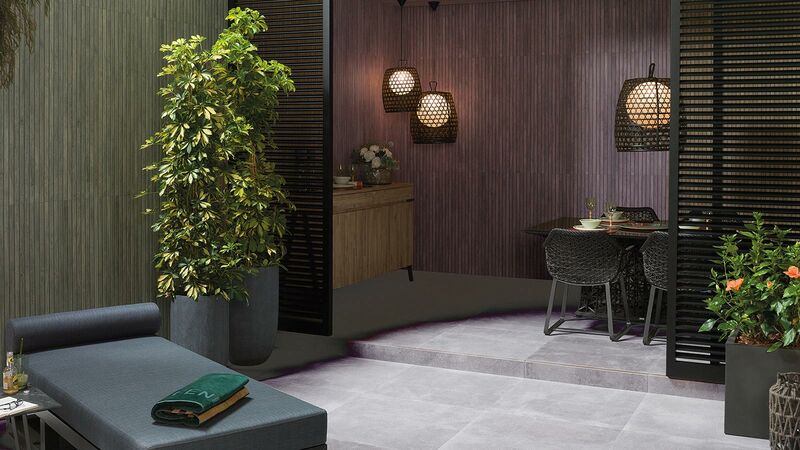 The result was a unique floor with five major interrelated areas noted for both their elegance and design through the integration of materials and products from PORCELANOSA Grupo. 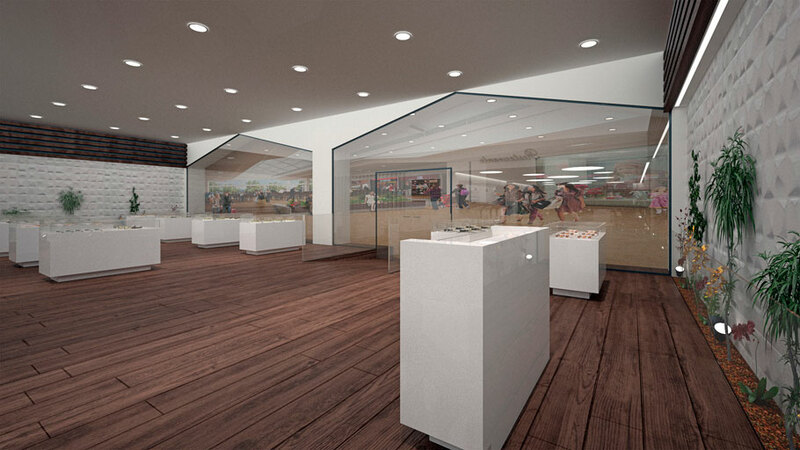 The shopping area is designed around a space in which the products are shown in white exhibitors as a gallery. For the design and manufacture of these exhibitors, the cutting-edge KRION® Solid Surface sheets compact mineral in its 1100 Snow White version was used. This material is perfect for being used in direct contact with food since it is certified for food use and anti-bacteria property. The area also stands out for being wide and sober, with a large amplitude for people passing through between exhibitors and the visual field open to the outdoors through large windows. mainly white and wood colour contrast, not only for the purity of KRION®, but also for the wall tiles with Oxo White Mosaic texture from Porcelanosa and the Hampton Brown floor tiles from Venis in a natural wood imitation mix. After the shopping area, we arrive at the access to the restaurant and sushi tasting area. 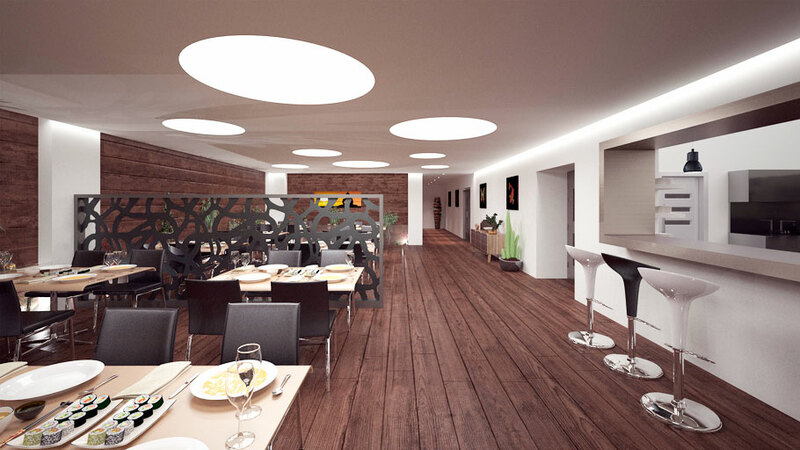 In this area, in which the tables are located, we find the PAR-KER ceramic parquet from Porcelanosa Casona Castaño as a wall tile, which, as well as the commercial area, is responsible for providing authenticity to the design. 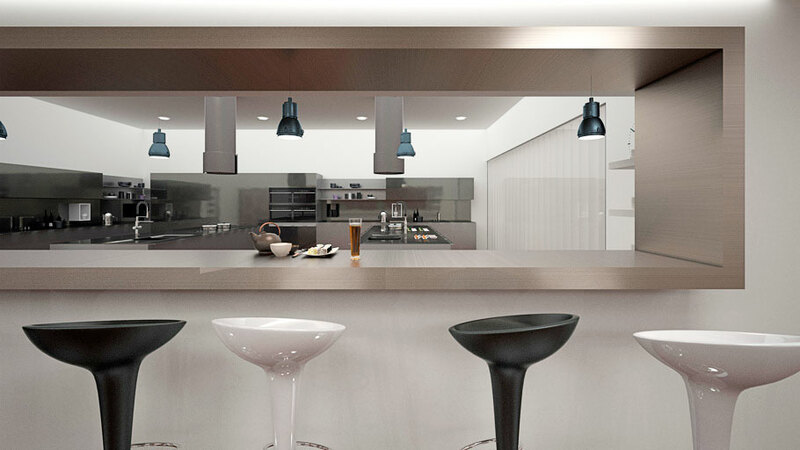 The restaurant is attached to the kitchen with a large countertop, also made of sheets from the KRION® 6906 Dark Grey acrylic stone. Meanwhile, the kitchen equipment done by Gamadecor, offers its E7.90 design for total practicality and functionality, work capacity and storage space. 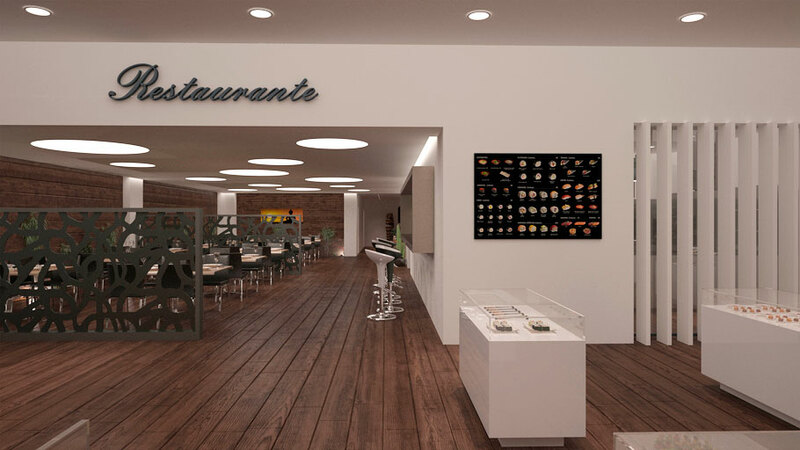 One aspect to be highlighted is the diner has the possibility to see, through the space bar, the preparation process of the products that they will later taste. The last two areas are the staff space and the bathrooms. 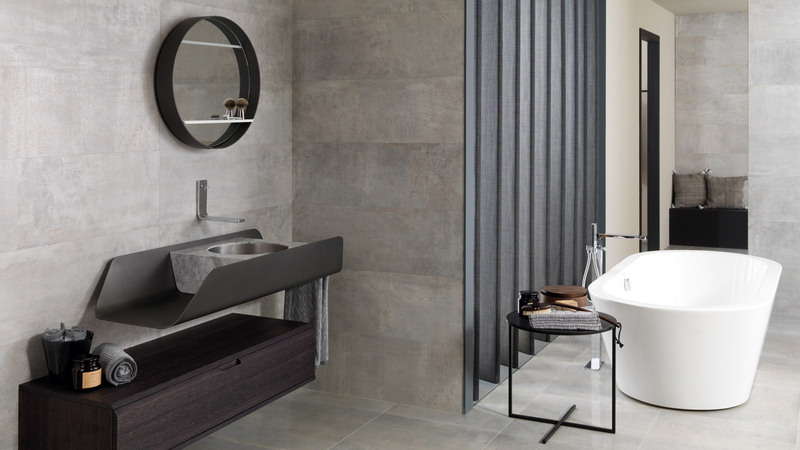 In these, the natural wood simulation in its finest porcelain quality is counted on, through the PAR-KER Casona Brown wall tile from Porcelanosa. 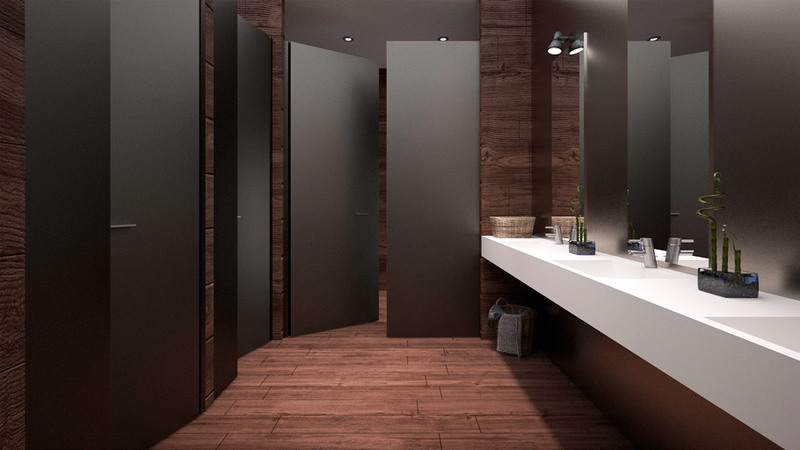 This is combined with a matte grey metal wall tile. 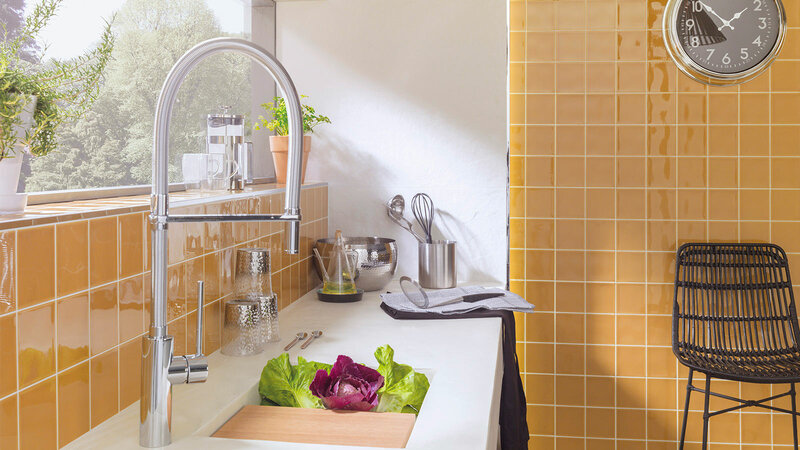 Regarding the bathroom equipment, the exclusive Lounge sanitaryware from Noken has been opted for, as well as the versatility of KRION® shining on the countertop basin in its Kole Worktop Plan Vasque Kole version. 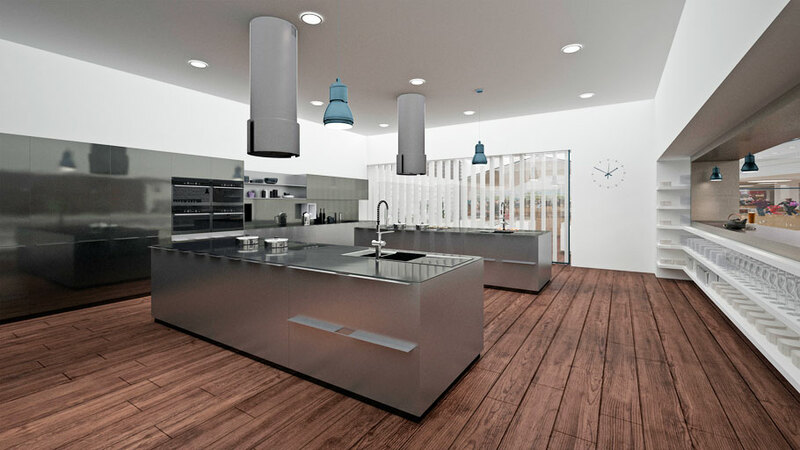 In relation to the concept store outdoors, this is coated with the STON-KER Avenue Dark Matt ceramic stone. In short, a project that combines oriental cuisine with a modern touch, together with the most authentic and cosiest of designs for a restaurant that makes you feel at home.